OPINION: IKPEAZU, OGAH, INEC and The Judiciary: The Way Forward By Ugochukwu Amaraizu. The Judiciary is an indispensable arm of government consequent upon the roles that it plays in the act of governance. However, the reverse seems to be the case in Abia State where due process is now sacrificed at the alter of desperation and selfish ambition. Following the purported issuance of Certificate of Return to Dr Uche Sampson Ogah by INEC upon the Federal High Court Order of 27th June, 2016, opinions have been divided on the legality and/or otherwise of the said Certificate. The problem seems to be more compounded when the Abia State High Court sitting in Osisioma issued an ORDER restraining INEC from issuing the said CERTIFICATE OF RETURN as ordered by Federal High Court and prohibiting the Chief Judge of Abia State or any other Judicial Officer from swearing in Dr Uche Ogah as the Executive Governor of Abia State. It is quite unfortunate that some of my learned friends who are driven by sentiment cannot be bold enough to state the true position of law in this critical time in our political history. A court Order, whether issued rightly or wrongly, has to be complied with. This is the way I see the attitude of INEC in relation to the Federal High Court Order calling for issuance of C of R to Dr Uche Ogah. However, this general principle of law admits of certain exceptions which include but not limited to filing of NOTICE OF APPEAL, STAY OF EXECUTION and service of same on the party in whose favor the Order is made. Though the attitude of some Courts varies in that some encourage execution of the Order where there is no other Order restraining compliance with the Order while some warn against execution upon service of the Notice of Appeal and Stay of Execution. It is quite disheartening that despite service of both the NOTICE OF APPEAL and STAY OF EXECUTION on INEC yesterday being the 29th day of June, 2016 as can be gleaned in the PROOF OF SERVICE acknowledged by an INEC staff, INEC, after issuing the certificate of return to Ogah, informed Nigerians that they never received service of the processes. Despite the proof of service, INEC was present in the matter when the Defendants informed the Court that they were appealing the judgment. That is by the way! Let’s take it that INEC has complied with the ORDER of the Federal High Court sitting in Abuja. The issue of swearing in the man whom INEC issued a certificate of return is now what calls for determination. Stories have it that Dr Uche Sampson Ogah is now warming up to be sworn in any moment from now as the duly elected Governor of Abia State. Can this be possible in Nigerian law? It is true that everything is possible in Nigeria. 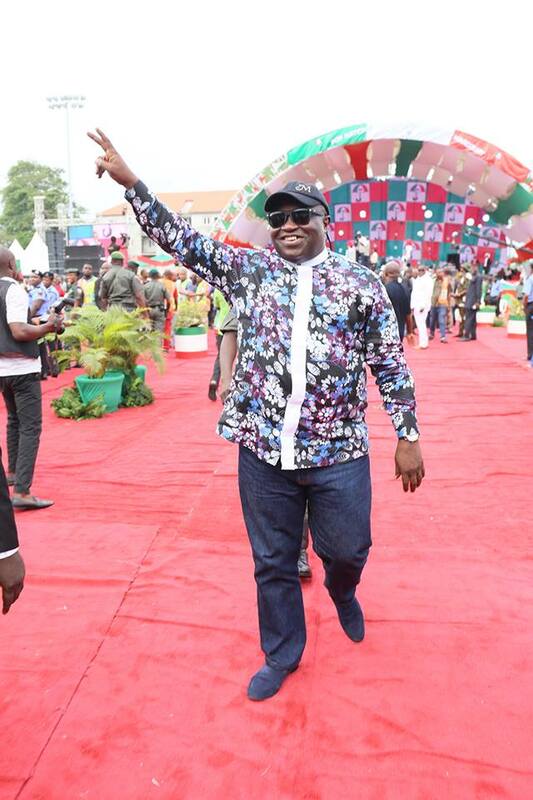 Is there any law backing what Ogah intends to do in Abia State? Having failed to honor service of the Notice of Appeal and Stay of execution, it became necessary that Dr Okezie Victor Ikpeazu resorts to another lawful means of protecting and guiding his mandate which was freely given to him by the people of Abia State. He quickly approached the HIGH COURT OF ABIA STATE sitting in Osisioma, who did not only issue an Order restraining INEC from issuing the certificate of return but proceeded to restrain the Chief Judge of the State or any other Judicial officer from swearing in Ogah as the Governor of Abia State. The aforementioned Order of the Abia State High Court was not made in vacuum. It stands on decided authorities and some statutory provisions. The Order was obtained ex parte pending the hearing of Motion on Notice and/or Substantive suit filed therein. It is not in doubt that Section 143(1) & (2) of the Electoral Act empowers the Governor to remain on seat till the final determination of his appeal and where he appeals within 21 days of delivering the judgment. This is the law where there is a claim ( as in the instant case ) that he was not validly elected. Ogah alleges that Ikpeazu was not validly elected by virtue of the false information which he claims that the latter presented to INEC. Ikpeazu, having appealed within 21 days as provided in the Act, is entitled to remain on seat till the final determination of his appeal. The law has it that the NOTICE operates as a stay to further action. INEC deliberately flouted the law of the land and claimed ignorance of service. In furtherance, Ogah is also bound to suffer the wrath of section 141 of the Electoral Act which provides that no Court can swear in a candidate who did not participate in all the STAGES of the election. What are we really talking about? Are Nigerians blind that they can’t read again? Permit me to correct some wrong impressions created by some interested persons in this our matter. Somebody argued that Abia State High Court has no power to make a pronouncement or issue an ORDER in this matter. I think that person is still living in the past no matter his age. Federal High Court in Nigeria is NOT greater than a State High Court. They are of the same level. The only difference is that there are few or selected matters which are exclusively reserved in the Constitution for the Federal High Court. See Sec 251 of the Constitution of the Federal Republic of Nigeria, 1999 ( As Amended ). It is only in those matters expressly outlined that the Federal High Court enjoys jurisdiction to the exclusion of other Courts. And this does not in any way make a Federal High Court or its Order superior to that of a State High Court. Apart from those ones, High Court of a State ventures into all other businesses. It is also pertinent to remark that appeals do not lie at Federal High Court from a State High Court. Appeals move from State High direct to Court of Appeal the same way it moves from Federal High Court direct to Court of Appeal. I therefore submit that the ORDER emanating from the Abia State High Court is in order. Whether it is wrongly or rightly issued, the Chief Judge of the State or any other Judicial Officer or a person acting in that capacity has no option than to comply.